Why use a Swiss Ball? 1- Improves function of postural and core stabilizing muscles. 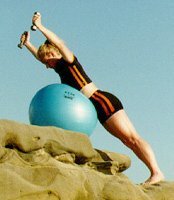 Stabilizing muscles balance the actions of prime mover muscles to coordinate smooth movement patterns. Core muscle strength rehabilitates injured joints and prevents further injury. 2- Improves posture by strengthening the supportive musculature of the spine hips and abdominals. 3- Improves integrity of stance, balance and agility by creating instability in the workout or training environment. This forces your own core muscles to enhance dynamic support and stabilization of your body during exercise, sport performance or everyday activities. 4- Increases core strength and development: training on a Swiss Ball requires constant recruitment of the core musculature, unlike fitness machines whereby stability of the weight is provided by the equipment. Being that all body movements emanate from the core it is essential to have a strong and well coordinated trunk musculature. Result: Improved function and ability to transfer more power from the core to the extremities. 5- Develops strength in all planes of movement (sagittal, transverse and frontal), as opposed to machine training that usually strengthens mainly in one plane of movement. Most injuries occur in the transverse or frontal planes; a sign that we should be developing more strength in these planes. Result: Improved functional strength and decreased chance of injury. 6- Challenges your nervous system resulting in improved speed for recruitment of muscles leading to better quickness, strength, power and overall performance. 7- Birth your baby on a TheraGear ® Pro ABS ball. This makes it easier on yourself and your baby. Gravity takes over, doing some of the work. Your baby moves downhill while properly positioned on one of our safe Birth Balls (choose only the Pro ABS for extra safety). You should choose the Theragear Swiss Pro ABS Ball for best birthing ball. Safety and less worry is a major concern for us..
Who should use a Swiss Ball? Bodybuilders, Gymnasts, Mixed Martial Artists, Mothers needing a birthing ball, Non-Athletes, Seniors, Elite Athletes, Back Pain Sufferers and those needing to reduce stress. Also, don't forget those wanting an unconventional but great ergonomic chair. What Is The Best Swiss Exercise Ball For You? We only recommend using exercise balls with an anti-burst quality known as an ABS Ball. Only such balls guarantee the safety needed while exercising, sitting or birthing on a ball. TheraGear's Superman Exercise Balls are made with the highest quality and safety standards. The technology of these state-of-the-art balls have a 2200 lb. weight capacity and 500 lb. anti burst rating. They will not explode if punctured. When a sharp object penetrates the skin of the ball, the air will escape slowly, lessening the risk of injuries. Important: Weight limits are measured in two ways, static and dynamic. Static weight is like you standing still on a bathroom scale. Dynamic weight is like you standing on the scale and exerting downward pressure by flexing your knees or bouncing on the scale. It is important to consider both ratings when deciding which ball is best for your needs.. 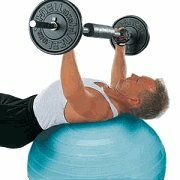 PRO ABS TheraGear® Swiss Ball: is a higher quality product than our basic model. The Pro ABS is manufactured by world reknowned German company. The TheraGear Swiss Ball Pro is specially developed for heavy-duty exercising where additional weight is used on the ball. This ball also has a special non-slip surface. The load rating for this ball is 2200 lbs static weight and a dynamic ABS weight limit of 500 lbs. This ball is used worldwide by professional athletes and trainers. Best Exercise & Body Ball Training DVD video. This Great Body Ball DVD offers 57 Gymnic Exercise Ball exercises for core training and sculpting of the entire body. Each training exercise is accompanied by vivid on-screen graphics showing descriptive images of the involved muscle groups. There are 3 complete workout routines designed to accommodate individual fitness routines and goals. We feel like you will really be impressed with what this exercise ball video has to offer -- WE WERE. Please Note: This Chart is a guide only and particularly applicable to exercising your spine on the ball according to original Swiss standards. Depending on your needs (sitting or exercising) you may need a different size. WEIGHTLIFTING WITH SWISS BALLS: Although our pro balls do have an anti-burst rating of 500 lbs., we certainly warn about the danger of doing exercise with more than your body weight on a swiss ball of any type or brand. Please note that if you choose to do such, you do so at your own risk, because even without bursting, the instability of this type of exercise could lead to undesirable consequence or injury. BIRTHING BALLS: Please note that our TheraGear Pro ABS Ball makes a great ball for birthing your baby. Make sure you only order a PRO BALL for this purpose as we do not consider the other safe enough for such an important purpose. TheraGear Ball Chair - The TheraGear Ball Chair was formerly the Pallone by Sissel; this healthy, versatile and ergonomic alternative offers a whole new ball game when you sit.